The process of testicular descent has provided a classic problem of developmental anatomy since the time of John Hunter. It also possesses considerable clinical importance since anomalies of testicular position are frequently encountered in man and in several domestic species. In spite of the great attention the subject has received since Hunter’s description of 1762 even recent accounts are still contradictory; the mechanisms involved are not completely understood. Several theories have been put forward to explain the changes in morphology involved in the movement of the testis from its site of origin in the genital ridge to its final resting place in the scrotum. Especially opinions on the role of the gubernaculum testis in the process differ. The results of recent research on the morphology of the process of testicular descent will be summarized. The information is confined to species with a strip-like cremaster muscle (e.g. pigs, dogs, cats, cattle, horses) since the process in species with a sac-shaped cremaster muscle (e.g. rodents), although in principle comparable, is morphologically different. 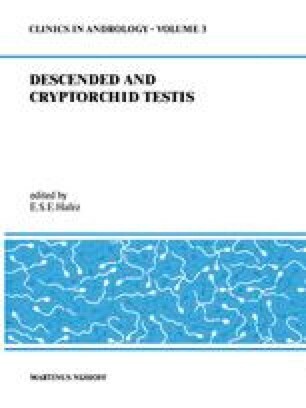 A description of normal as well as of abnormal morphology of testicular descent will be followed by some notes on the regulation of this process.